I love this and wish could talk my husband into it! This is exactly like the kitchen floor in the new Alvin and the Chipmunks! (Don't judge me for knowing this...) Every time I see it (yes, there have been multiple viewings, and yes, I am ashamed) I swoon over it. To be honest, I swoon over Dave's entire house. Then I think to myself, "What single bachelor has a house like that?! And a KitchenAid Pro Mixer?! Not a straight one... that is for sure..."
Artistically, it looks awesome. Logisitically, would it chip? I keep waiting for a client to want me to do that to a floor. It'd be so nice for the portfolio. I love it. I have wooden kitchen floors. They are not painted, but I think they would be fine if finished properly. This look is fabulous. Go for it! Oh, the painted floor is GREAT! I have a painted floor in my dining room and i LOVE it! i used outdoor deck paint that was tinted Benjamin Moore's White Dove, it's really, really pretty. i have a giant seagrass rug on it under the table to protect it from scratching chair feet, but otherwise it's been a dream. Go for it!! I have that same reproduction piece of art hanging on the wall of the girl holding the cat that you see as you look through the room to the next room--love it! P.S. I think it's stained, not painted. Easier upkeep. Perfect for a Tudor. So nice as a contrast to your marble - practical too since it can handle getting a bit beat up and keep a nice patina. 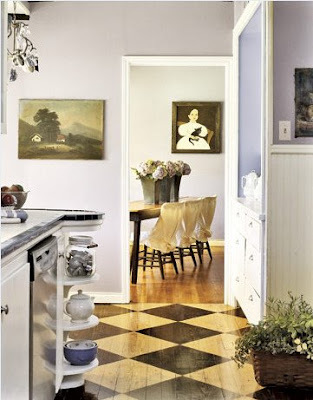 Do you think that two colors of cork flooring, set in a diamond pattern like this, would look almost as good? I'm considering that for my kitchen.